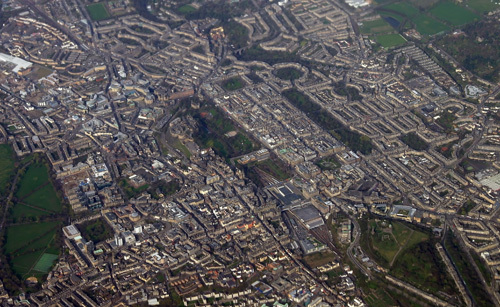 Click here for the full size image, opens in a new window, the fuzziness around the edge is due to the plane window. The train station is bang in the middle of town and could not be more convenient, taxis are available inside and outside the station. Buses to and from the airport stop just outside the station (Waverley Bridge, top of the vehicle ramp) and take about half an hour to reach the airport from this point. The airport buses also stop at Haymarket and other points along the route. Unless you have a large number of bags, are unsure of your hotel location or can’t risk a walk for some reason I would recommend the bus over a taxi – return tickets are available at a slight discount, details here Airlink. At the airport the Airlink stand is just outside the arrivals door, buy the tickets from the booth before getting on the bus. Cafe Royal – West Register St. Founded 1826 – although not at this site, famous for oysters. Handy location just off Princes St. The National Gallery of Scotland on Princes St has a very pleasant cafe in the basement/ lower ground floor. Very good at lunchtimes and the setting overlooks Princes St gardens. 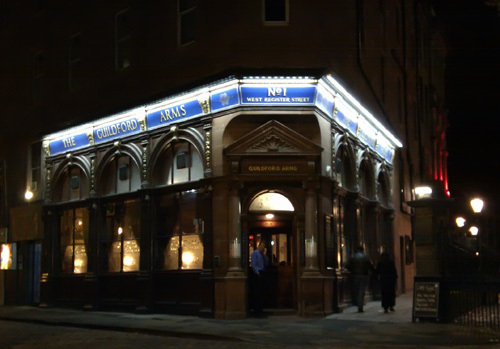 Oloroso – Castle St (just off George St) central bar & restaurant with great roof terrace giving views of the castle. Not the friendliest of entrances, at street level it looks like the entrance to an office block; but take the lift to the 3rd floor and things improve. Cafe Andaluz – Spanish restaurant, branch on George St. 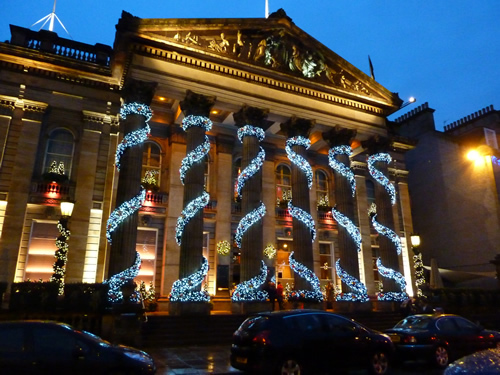 The Dome – Bar and Restaurant, George St. There is also a terrace cafe at the rear of The Dome, down some steps from Rose St, see below. Having ordered an early lunch, the heavens opened and within minutes we were all sheltering under cover. The staff were incredibly efficient at sorting all this out. ‘Does this happen often’, I asked. The response, ‘Oh, about three times a day’. Dubh Prais – Scottish restaurant on the Royal Mile (opp SAS Radisson), small sign at street level (of a black cauldron) as the restaurant in the basement. 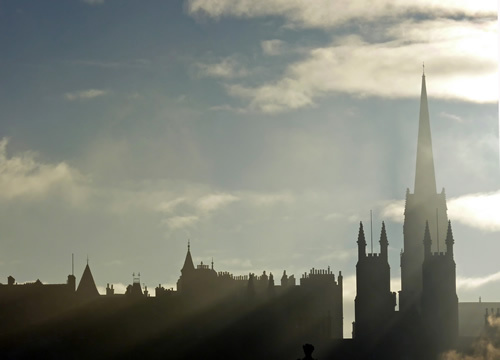 The Witchery – Atmospheric restaurant specialising in top quality Scottish produce, right by the castle entrance. Also has accommodation. Wildfire – Small bistro at 192 Rose St (Castle end), steak and seafood, has some good value set meals at lunchtime. Fishers in the City – Primarily (but not exclusively) fish restaurant, also has vegetarian selection. Excellent quality food and service at a very reasonable price, highly recommended. This branch is at 54 Thistle St (just behind George St). Dusit – Thai restaurant 49a Thistle St (opposite Fishers above). Very good Thai food and somewhat surprisingly (to me anyway) quite a large vegetarian selection. Looks small from the front but there is s larger area at the back, however, very popular so may be wise to book. Amarone – Sister Restaurant to the branch in Glasgow, great location on St Andrew Sq and the menu seems more extensive than I remembered in the Glasgow branch. There is an informal area as you enter, and then there are regular table and booths as you move further in. The informal area would be handy if you just wanted a snack or quick meal. Be careful what the staff recommend ‘tho; I was prompted to have some Focaccia with my order of bread and olives – which would have been quite a lot of bread and cost about £10. Good food and well presented. 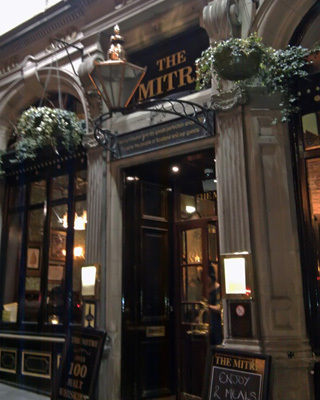 The Mitre on The Royal Mile (opposite the Radisson SAS); good selection of beers and whiskys, food most of the day. Round the back of the Guildford Arms (alley to the right on the photo above) is the Cafe Royal, bar and restaurant, very traditional and atmospheric. Above the Cafe Royal The Voodoo Rooms, check the website for details – bars and restaurant. 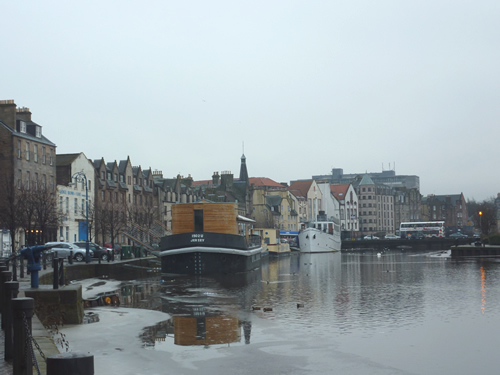 Leith is the old port of Edinburgh, it is a separate town and does have its own feel and character. Much has been made of the regeneration of the area; which was kick started by the locating here of the Royal Yacht Britannia after decommissioning. 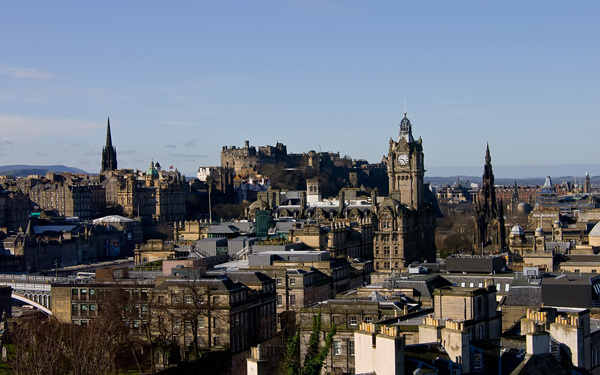 However; there are three Leiths: the main town/ shopping area, the new shopping area with the Britannia, and finally the Water of Leith/ old port area. 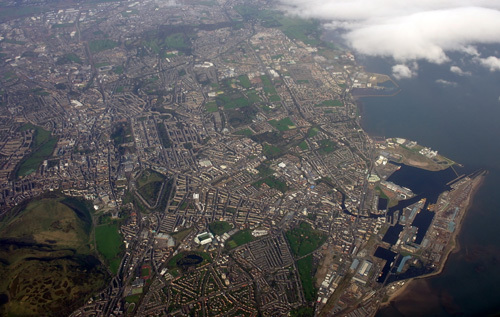 The main town of Leith has nothing to interest the casual visitor; it seems to be mostly budget shops like Poundland, with the occasional free trader surviving since the 70’s and still holding original stock – I had no idea you could still get Hai Karate and Coty L’Aimant. Apart from the yacht Britannia, the new shopping mall has nothing of interest; the shops are all the usual suspects of any UK mall. Worst of all, the designers have completely failed to give any flavour of the location; there are hardly any external windows apart from around the food court, so you could be in any bland mall anywhere – considering where this is (on the waterfront) and the fact that the Yacht Britannia is right next to the building, the poor design is a criminal waste of location and asset… the whole place is boring and claustrophobic. The restaurant/ trendy part of Leith is the Water of Leith/ old port area, and this is really the only part that is worth visiting. There are a selection of shops and restaurants along Commercial St (in old Bonded warehouses) and more along the waterside. We ate in Fishers, which was excellent, and then moved on to The Shore next door, same company own both places.